In view of the large variety of products in the chemical and food industries, it will come as no surprise that Abster Equipment also supplies an extremely varied range of machines. This variation is not only in design and operating principle, but also in materials used. For products with low viscosity and good adhesion properties. The rotating drum dips directly into the melt contained in a heated pan under the drum. A film of product solidifies immediately on the drum surface during its contact with the melt. In addition, a thin layer of liquid adheres to the solid layer, passes out of the pan and solidifies during completion of the drum revolution. This system is used for low viscosity products with good adhesion to metal surfaces. Among the products processed on this type of drum flaker are phtalic anhydride, caprolactam, fatty acids, bisphenol, naphthalene and DMT. A heated applicator roll is located under the drum and dips into the melt. The film of liquid melt that sticks to the applicator roll is transferred to the cooling drum and solidifies. For products with good adhesion to metal surfaces and low to moderate viscosities, flake thickness may be controlled between certain limits. Applications are flaking of various waxes, resins, and catalysts. For accurate control of end product thickness and shape. An internally heated applicator roll is located above the cooling drum. The melt is fed into the nip between the applicator roll and the drum. 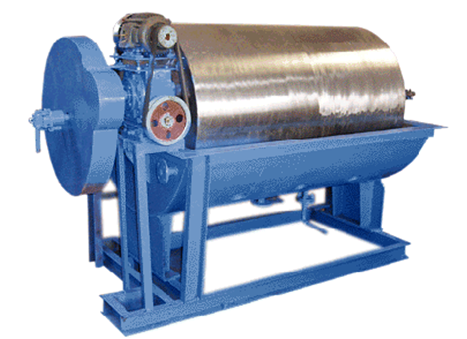 Contact with the heated roll ensures that the product remains liquid in the feeding system. Heated endplates prevent leakage of the melt to the sides both during applicator roll gap setting and thermal expansion. A film of melt passes through the gap between the roll and the drum, sticks to the cold drum, and solidifies. For products showing poor adhesion to metals and moderate to high viscosities, flake thickness may be controlled accurately through the gap setting mechanism of the applicator roll. Applications can be found for example in processing of soaps, stearates, and fatty acids.